Terry Yumbulul was born around 1950 on Wessell Island, part of the English Company Islands, off the coast of North East Arnhem Land. He grew up at the mission on Elcho Island, where he attended the local school. Terry is a member of the Warramiri clan whose lands comprise the Wessell Islands, the English Company Islands, the Bromby Islands and areas on mainland Australia in North-eastern Arnhem Land. He is the traditional owner to some thirty-six islands, and is a respected tribal elder and prominent community figure. Terry worked as a plant operator for several years before traveling to Adelaide with his family to attend college to further his education. Here he started his art career, creating small pieces at first then progressing to much more significant pieces with the approval of his elders. In 1983 - 84, the Northern Territory Government commissioned him to create ten works for the Museum and Art Gallery of the Northern Territory. Terry became the first Aboriginal artist to have his work immortalised in the style of the television age, through animation in advertising. He produced eighteen ochre paintings for the basis of a series of commercials produced for the Northern Territory Tourist Commission in a fusion of sophisticated themes and modern concepts. One of Terry's works, a sacred feathered Morning Star Pole from the collection of the Australian Museum, was illustrated on the ten dollar note, commemorating Australia's Bicentenary. 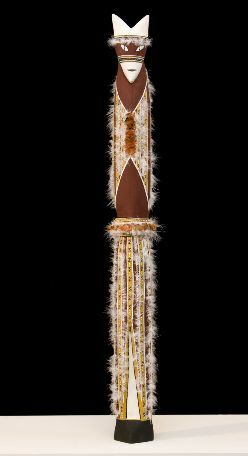 These poles are used in the funeral ceremonies and represent the Morning Star to which the deceased person's soul rises. Terry's pieces have deep spiritual value, depicting the legends and history of his people. His imagery, with the fine linework, is easily understood and the viewer begins to learn something of the Aboriginal history of the land, the surrounding sea and the creatures which inhabit them. Terry creates his sculptures from local trees (often stinkwood) while he uses canvas for paintings, rather than traditional bark, which is a concession to the need for conservation and a more efficient, lasting material. He does however, maintain the tradition of bark painting in his use of natural ochres in the traditional colours of his Warramiri Tribe - red from Wessell Island; yellow from Elcho Island; black from Groote Eylandt and white from a site near Mica Beach. Terry believes these colours to be the colours of Australia which should be enjoyed by all. Terry believes in and lives by the principles learnt during his childhood. These come from stories depicting events such as when the explorer Matthew Flinders arrived in Arnhem Land, his crew came ashore and the people of the local tribe flocked to welcome them. The white man wanted water and the black people knew how to find it and together they worked to replenish the ship's supply.